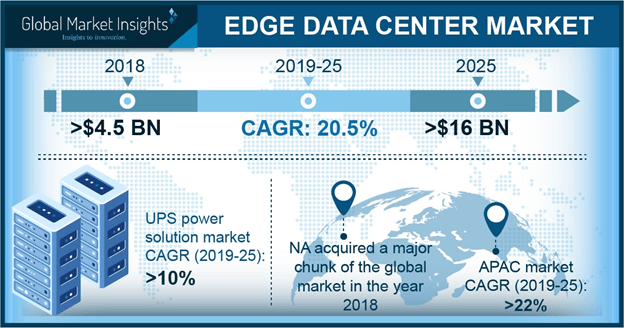 Power « Global Market Insights, Inc.
Nlyte’s partnership with the IBM Watson IoT group is an exemplar precedent underlining rapid expansion of data center infrastructure market. Recently inked, through this deal, the companies intend to leverage maximum potential of advanced analytics and AI in its data centers. Speaking of the strategic agreement, one of the spokesperson of Nlyte has been quoted saying that the complexity, scalability, and optimization of modern data centers demand the requirement of advanced analytic solution integration. Reportedly, Nlyte is amalgamating its patent NEO (Nlyte Energy Optimizer) with IBM Watson’s advanced AI abilities in a quest to provide data centers with new heights of operational comprehensiveness. This alliance, as per experts’ opinion, has surely strengthened Nlyte’s stance in data center infrastructure market that pegged a valuation of USD 40 billion in 2017. A stringent regulatory framework speaks volume and has much to contribute in data center infrastructure industry augmentation. With cyber-attacks becoming a global concern, various regulatory bodies have mandated guidelines to identify and continuously monitor potential vulnerabilities in digital infrastructure. Companies partaking in data center infrastructure market therefore, now are extremely particular to develop solutions that are completely in compliance with regulatory standards. In this regard, recently Nlyte Software made its way to headlines, for receiving the much awaited approval for its DCIM solution from the Department of Homeland Security. Allegedly, the latest approval makes the America data center infrastructure industry giant to become the first DCIM solution provider in the United States that has strictly adhered to all the conditions mentioned in the Phase 1 of CDM program (Continuous Diagnostics and Mitigation) of the federal government. For the records, the U.S. federal government rolled out this aforementioned CDM Program few years back, in a bid to ensure integrity and security of hardware as well software assets of the nation. Not to mention, with increasing adoption of these regulations, U.S. data center infrastructure industry is certain to carve a profitable roadmap over the ensuing years. Citing yet another instance where governmental initiative has given a substantial boost to regional data center infrastructure market, the Northern Territory of Australia that has released its Budget for the year 2018-2019, has allocated a sum of AU$18.38 million to support initiatives that are under the Department of Corporate and Information Services. Reportedly, as a part of the scheme, the government has a plan to increase its number of physical servers and number of fully managed servers by 16 and 100 respectively in this financial year. With such enormous project in the pipeline, regional data center infrastructure market players are sure to gain monetary benefits in securing Australia’s data center network. Speaking of the regional aspect, it is prudent to mention that Asia Pacific is at the vanguard of data center infrastructure industry. In fact, Asia Pacific market is forecast to witness nearly 14% CAGR over 2018-2024. The growth can be primarily attributed to the increased penetration of digital technologies among consumers as well as businesses across this belt. Rapid industrialization along with robust growth in outsourcing activities especially in countries like India and China have led to a subsequent increase in organizational data traffic. In a bid to accommodate this huge traffic, companies are increasingly investing in new facilities, thereby proliferating APAC data center infrastructure industry. 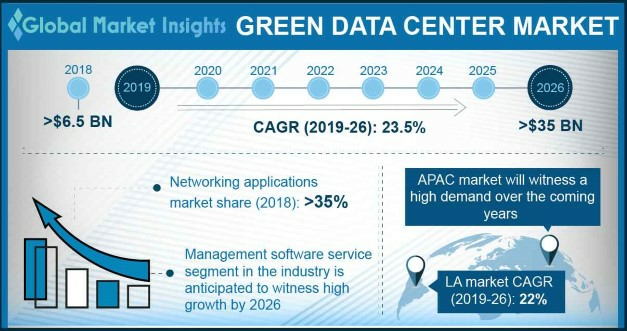 Despite these growth opportunities, data center infrastructure market is still facing a challenge of bridging complex web of interconnections with a data center network. Nonetheless, with the advent of optimized workflow procedures, adoption of real-time monitoring system, and enhanced tools, the aforementioned stumbling block is likely to get overcome within a short span. Furthermore, the lure of big data analytics and extensive proliferation of cloud technologies would leave a complementary influence on data center infrastructure industry space. In terms of commercialization, the business space is forecast to exceed a massive valuation of USD 90 billion by 2024. This entry was posted in Electronics and Media and tagged BFSI, Colocation, Cooling, Data Center Infrastructure Market, Data Center Infrastructure Market Analysis, Data Center Infrastructure Market Report, Data Center Infrastructure Market Share, Data Center Infrastructure Market Size, DCIM, ENERGY, Government, Hardware, Healthcare, IT & Telecom, IT Racks & Enclosures, LV/MV Distribution, Manufacturing, Networking Equipment, Power, Services, Software, UPS.